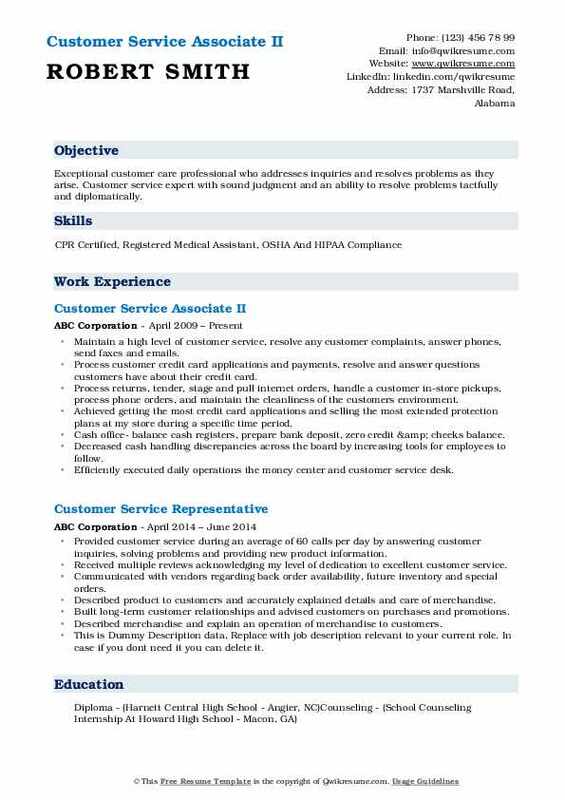 The job description of a Customer Service Associate is to support the organization by performing various tasks related to customer service. 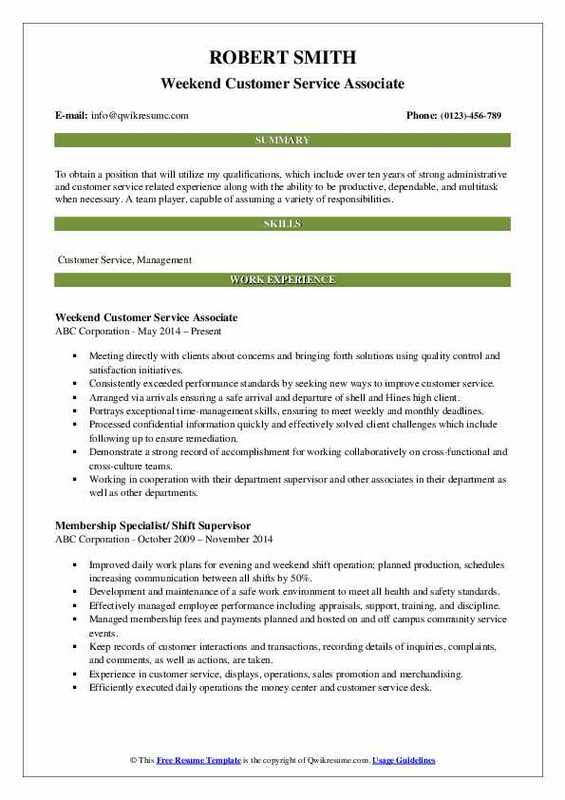 To fulfil this role, the customer service associate is involved in carrying out various other tasks such as – greeting customers and giving spontaneous customer service, supporting and following all measures, providing technical support and troubleshooting issues, assessing customer needs and rendering appropriate service, resolving billing issues, read or interpret the problem of the customer accurately and render timely response. As the job deals with handling different type of customers, the CSA is expected to possess service-oriented approach, and have a friendly and pleasing attitude. They should have to ability to interpret and speak on phone for a long time; word processing skills and data entry skills are also expected. 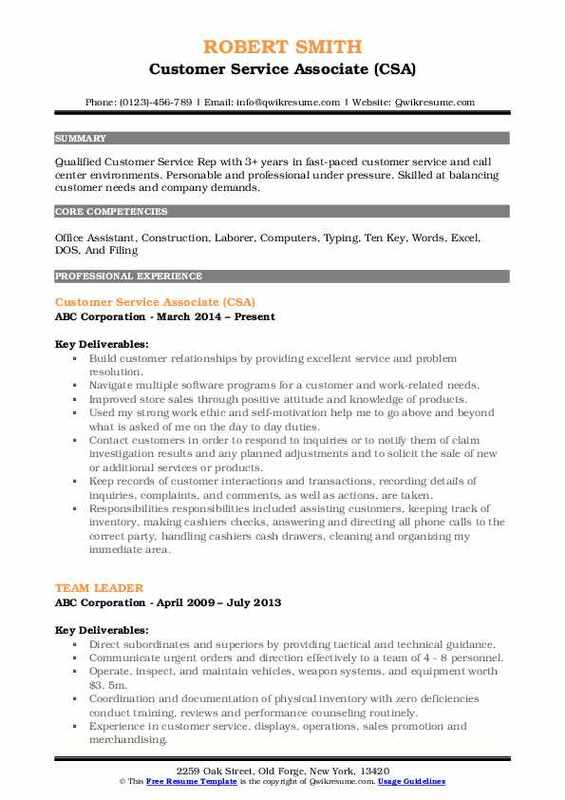 A well-crafted Customer Service Associate Resume should make a mention of GED or college degree. 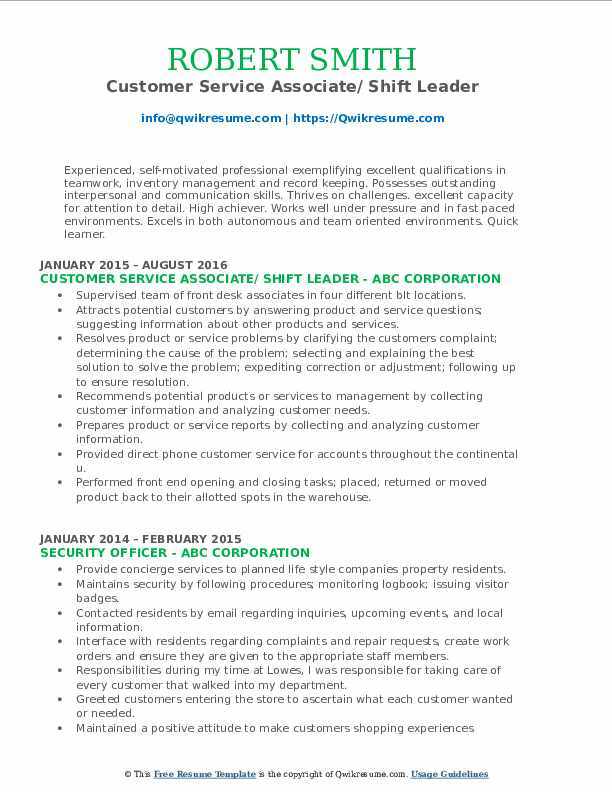 Summary : A dedicated Customer Service Associate who provides exceptional customer service through active listening and problem solving. In my 5 years of customer service I have gained the knowledge of how to best assist all types of people even in the most challenging situations. I am driven to not only meet but to EXCEED all expectations and deliver a positive experience though high quality customer care whether face to face or over the phone. Described merchandise and explain an operation of merchandise to customers. Monitored product standards, examining samples of raw products and processing tests, to ensure the quality of all finished products. Check to ensure that appropriate changes were made to resolve customer' problems. Empathize with the customer as to gain insight to the circumstances they were experiencing. Summary : To have a positive effect on a company by utilizing my leadership, organizational and problem solving skills and to contribute to the growth and success of the company, while providing excellent customer service. Provide support to accounts by entering orders, returns, tracking shipments, providing stock status reports, problem-solving and providing solutions. Submit credit requests for defective product, pricing errors and customer accommodations. Ensure product is being delivered to the customer in a timely manner and in adherence to their requirements and specifications work with the shared services team to ensure customer pricing, order requirements and routing are set up correctly. Work closely with the merchandising team to assess current stock conditions in canada, enter and coordinate warehouse transfers to fulfill stock needs. Trained colleagues in excel, sap and customer service at multiple facilities within the company. Create training schedules and guidelines and provide training to new employees on sap and customer service. Help assess current processes and develop updated processes, within my team, to improve efficiency and accuracy. 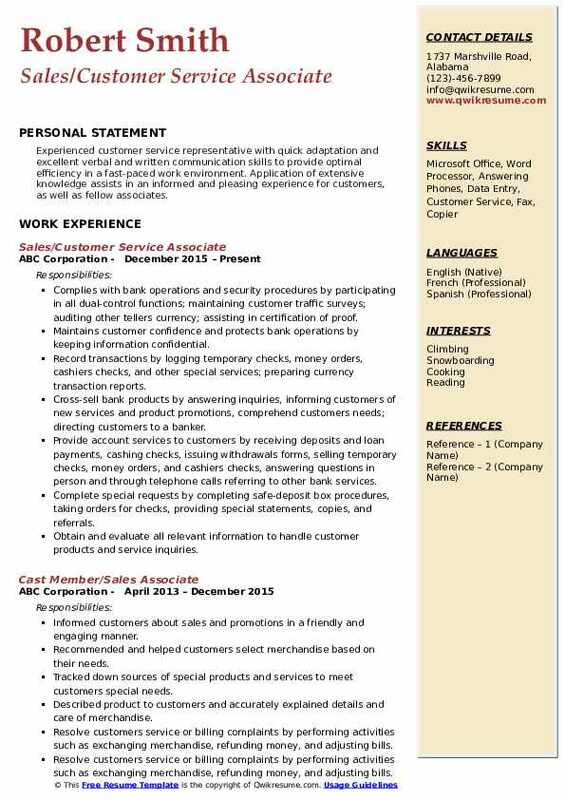 Summary : To obtain a position that will utilize my qualifications, which include over ten years of strong administrative and customer service related experience along with the ability to be productive, dependable, and multitask when necessary. A team player, capable of assuming a variety of responsibilities. Meeting directly with clients about concerns and bringing forth solutions using quality control and satisfaction initiatives. Consistently exceeded performance standards by seeking new ways to improve customer service. Arranged via arrivals ensuring a safe arrival and departure of shell and Hines high client. Portrays exceptional time-management skills, ensuring to meet weekly and monthly deadlines. Processed confidential information quickly and effectively solved client challenges which include following up to ensure remediation. Demonstrate a strong record of accomplishment for working collaboratively on cross-functional and cross-culture teams. Working in cooperation with their department supervisor and other associates in their department as well as other departments. Summary : Dedicated customer service representative motivated to maintain customer satisfaction while enhacing the sales and profits for the company's success. Skills : Windows XP, Vista, Microsoft Office Oracle Financials, Remedy, Microsoft Certified Professional, WDOT Computer System. Assist with billing inquiries and invoices and provide technical support. Assist team members who are not cleared with day to day to duties in the dod computer database. Help assist in setting up peripheral equipment, hardware, and software whenever needed. 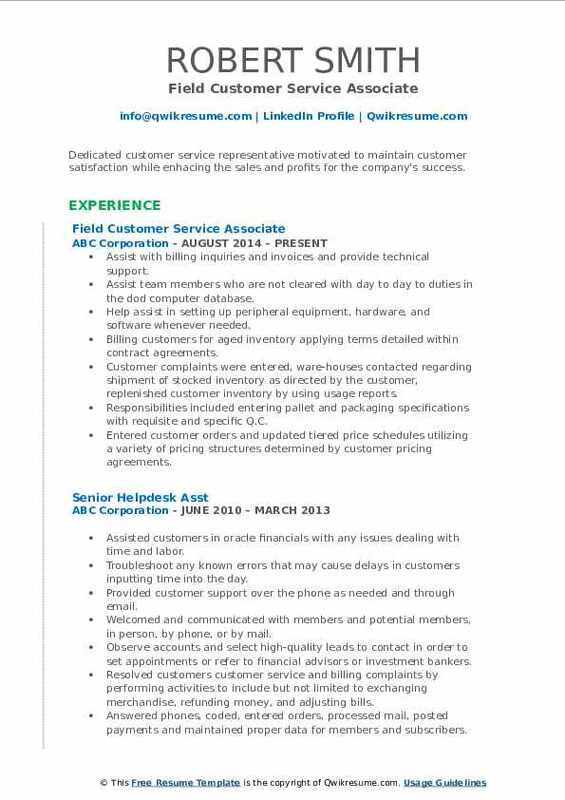 Billing customers for aged inventory applying terms detailed within contract agreements. Customer complaints were entered, ware-houses contacted regarding shipment of stocked inventory as directed by the customer, replenished customer inventory by using usage reports. Responsibilities included entering pallet and packaging specifications with requisite and specific Q.C. Entered customer orders and updated tiered price schedules utilizing a variety of pricing structures determined by customer pricing agreements. Objective : Seeking to expand my experience in customer service within an environment where I am able to thrive and succeed, not only as an individual but within a team geared towards providing an exceptional customer experience for all whom we serve. Assist in the administration of payroll, employee discipline, and scheduling and administrative duties. Oversight of cash transactions and bank deposits; respond and to resolve escalated customer service issues. An initiated rollout of new enterprise software solution for United and Delta airline reporting and documentation. Spearheaded cross-functional initiative to achieve successful dual operations of both United & delta ramp and ticket counter/gate functions. Strengthened company's business by leading implementation of excellent customer service and hospitality procedures. Maintained courteous member service at all times while monitoring a smooth flow of members through the registers. Headline : Exceptional customer care professional who addresses inquiries and resolves problems as they arise. Customer service expert with sound judgment and an ability to resolve problems tactfully and diplomatically. Maintain a high level of customer service, resolve any customer complaints, answer phones, send faxes and emails. Process customer credit card applications and payments, resolve and answer questions customers have about their credit card. Process returns, tender, stage and pull internet orders, handle a customer in-store pickups, process phone orders, and maintain the cleanliness of the customer's environment. Achieved getting the most credit card applications and selling the most extended protection plans at my store during a specific time period. Cash office- balance cash registers, prepare bank deposit, zero credit & cheeks balance. Decreased cash handling discrepancies across the board by increasing tools for employees to follow. Efficiently executed daily operations the money center and customer service desk. Summary : Experienced, self-motivated professional exemplifying excellent qualifications in teamwork, inventory management and record keeping. Possesses outstanding interpersonal and communication skills. Thrives on challenges. excellent capacity for attention to detail. High achiever. Works well under pressure and in fast paced environments. Excels in both autonomous and team oriented environments. Quick learner. Supervised team of front desk associates in four different blt locations. Provided direct phone customer service for accounts throughout the continental u. Performed front end opening and closing tasks; placed, returned or moved product back to their allotted spots in the warehouse. 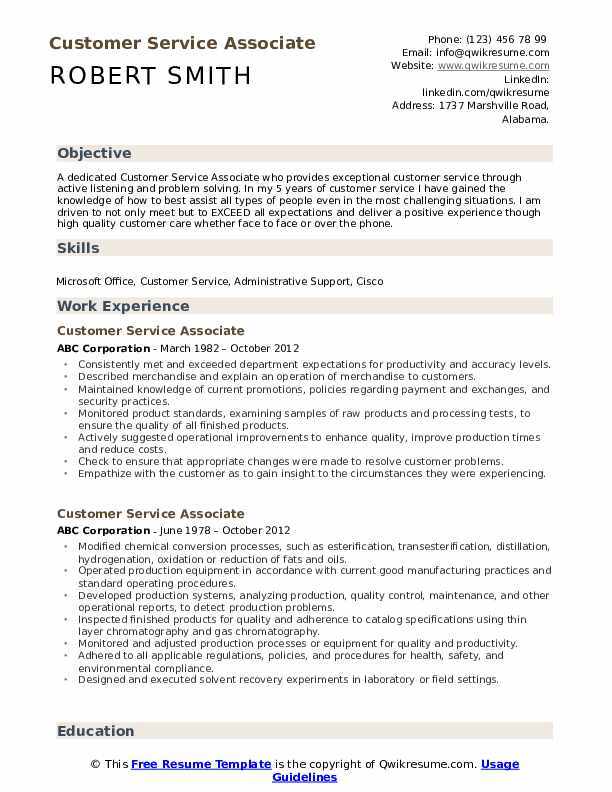 Summary : Qualified Customer Service Rep with 3+ years in fast-paced customer service and call center environments. Personable and professional under pressure. Skilled at balancing customer needs and company demands. Build customer relationships by providing excellent service and problem resolution. Navigate multiple software programs for a customer and work-related needs. Improved store sales through positive attitude and knowledge of products. Used my strong work ethic and self-motivation help me to go above and beyond what is asked of me on the day to day duties. Contact customers in order to respond to inquiries or to notify them of claim investigation results and any planned adjustments and to solicit the sale of new or additional services or products. Keep records of customer interactions and transactions, recording details of inquiries, complaints, and comments, as well as actions, are taken. Responsibilities responsibilities included assisting customers, keeping track of inventory, making cashiers checks, answering and directing all phone calls to the correct party, handling cashiers cash drawers, cleaning and organizing my immediate area. Process 50+ returns and exchanges within an eight-hour shift while ensuring customer satisfaction. Headline : Experienced customer service representative with quick adaptation and excellent verbal and written communication skills to provide optimal efficiency in a fast-paced work environment. Application of extensive knowledge assists in an informed and pleasing experience for customers, as well as fellow associates. Complies with bank operations and security procedures by participating in all dual-control functions; maintaining customer traffic surveys; auditing other tellers currency; assisting in certification of proof. Record transactions by logging temporary checks, money orders, cashier's checks, and other special services; preparing currency transaction reports. Cross-sell bank products by answering inquiries, informing customers of new services and product promotions, comprehend customer's needs; directing customers to a banker. Provide account services to customers by receiving deposits and loan payments, cashing checks, issuing withdrawals forms, selling temporary checks, money orders, and cashier's checks, answering questions in person and through telephone calls referring to other bank services. Complete special requests by completing safe-deposit box procedures, taking orders for checks, providing special statements, copies, and referrals. Obtain and evaluate all relevant information to handle customer products and service inquiries. 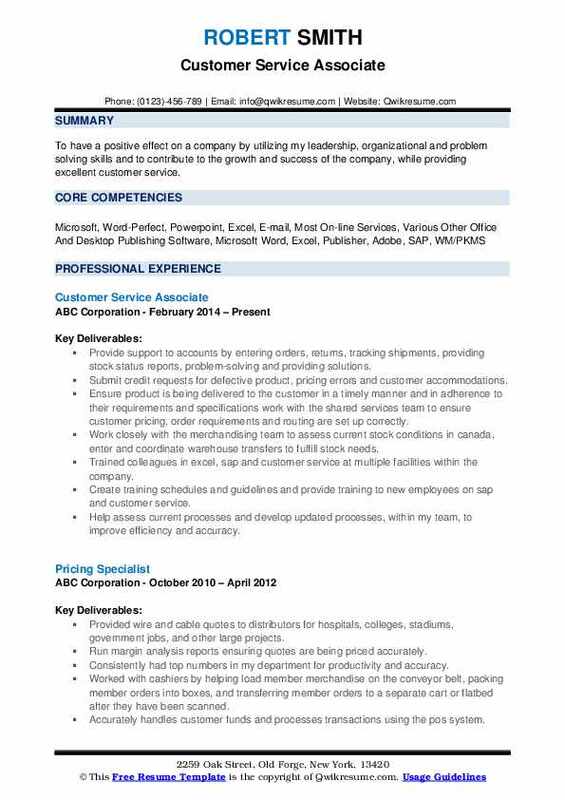 Objective : Seeking long term employment in an organization where I can grow professionally, utilize my current skills to assist in advancing a business and further enhance my abilities, knowledge and experience to face and overcome the challenges of today's changing work environment. 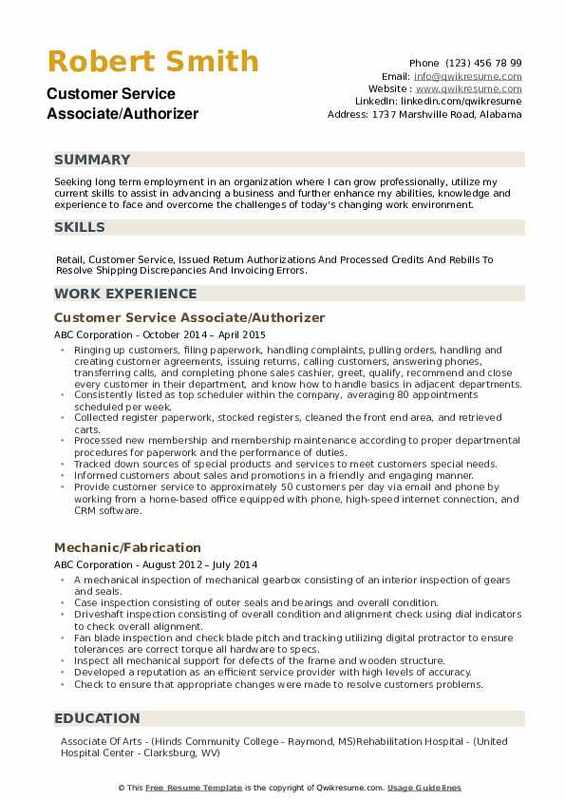 Skills : Retail, Customer Service, Issued Return Authorizations And Processed Credits And Rebills To Resolve Shipping Discrepancies And Invoicing Errors. Ringing up customers, filing paperwork, handling complaints, pulling orders, handling and creating customer agreements, issuing returns, calling customers, answering phones, transferring calls, and completing phone sales cashier, greet, qualify, recommend and close every customer in their department, and know how to handle basics in adjacent departments. Consistently listed as top scheduler within the company, averaging 80 appointments scheduled per week. Collected register paperwork, stocked registers, cleaned the front end area, and retrieved carts. Processed new membership and membership maintenance according to proper departmental procedures for paperwork and the performance of duties. Provide customer service to approximately 50 customers per day via email and phone by working from a home-based office equipped with phone, high-speed internet connection, and CRM software. Headline : I have worked in customer service jobs both in call centers and retail stores. 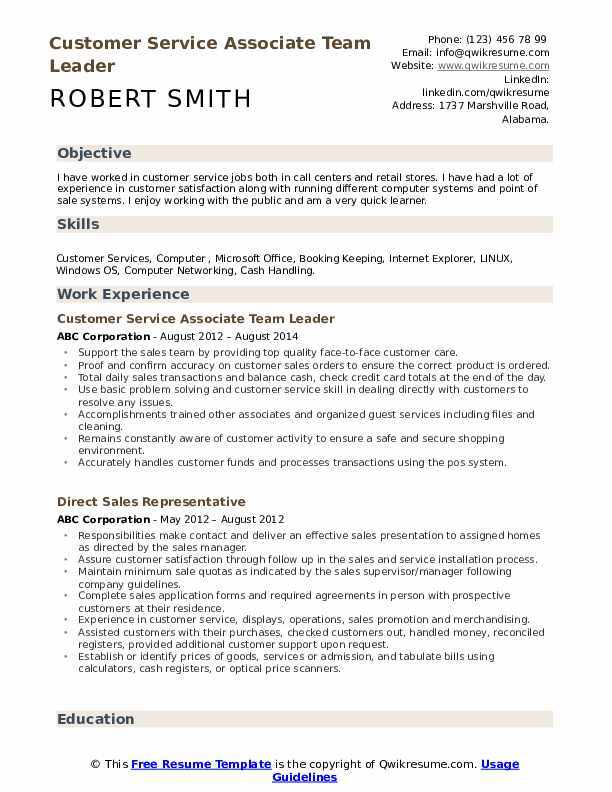 I have had a lot of experience in customer satisfaction along with running different computer systems and point of sale systems. I enjoy working with the public and am a very quick learner. 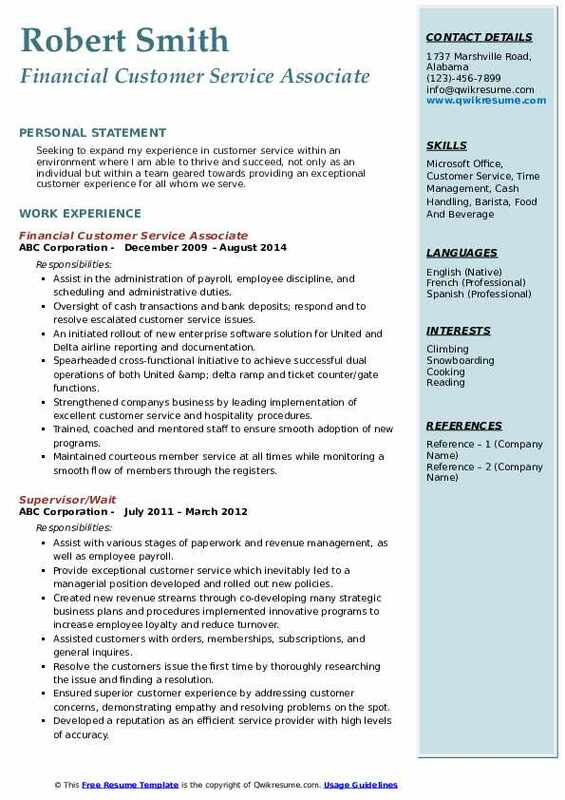 Skills : Customer Services, Computer , Microsoft Office, Booking Keeping, Internet Explorer, LINUX, Windows OS, Computer Networking, Cash Handling. Support the sales team by providing top quality face-to-face customer care. Proof and confirm accuracy on customer sales orders to ensure the correct product is ordered. Total daily sales transactions and balance cash, check credit card totals at the end of the day. Use basic problem solving and customer service skill in dealing directly with customers to resolve any issues. Accomplishments trained other associates and organized guest services including files and cleaning.